Have you ever idly speculated about how the visionary epic "Dark City" might have been changed if director Alex Proyas had been replaced halfway through by Baz Luhrman? Have you lain awake at night contemplating what one of Luc Besson's bombastic blockbusters might be like without the lucid narrative? Have you ever discussed with friends and loved ones what might have occurred if Lars von Trier had received notes from his producers on how to transform his notoriously depressing "Melancholia" into something more audience-friendly, and he perversely chose to follow each and every one of them to the letter? If the answer to all of these hypotheticals is "yes," the bad news is that you have pretty much wasted a chunk of your existence on nonsense. The good news, speaking of nonsense, is that you no longer have to imagine what any of those things would be like because "Upside Down" is a film that does all of it and much more. Simply put, this is one of the craziest films to come along in a while and I can confidently say that anyone who sees it will either hail it is some kind of crackpot masterpiece or dismiss it as one of the silliest damn things they've ever seen. Either way, those planning on seeing it should make sure that the multiplex floor is clean because their jaws, if not their entire bodies, are likely to resting down there for much of the running time. Remember how the sci-fi masterpiece "Metropolis" (1927) posits a world in which society has been literally split into two unequal classes? The rich, living in an impossibly luxurious city in the sky, ruthlessly exploit the resources and labors of the hardscrabble working class that dwells below ground in unspeakable poverty? "Upside Down" takes that conceit and flips it on its head by offering a vision of twin planets that are literally within shouting distance of each other — their respective highest mountain peaks almost touch — and which have gravities that pull in opposite directions. Those on the upper planet are prosperous and comfortable while those on the lower planet are poor, miserable and fighting for whatever scraps they can glean from above, mostly in the form of bits of an anti-gravity metal that can allow one to pass from one world to the next without detection. This substance is zealously guarded by Transworld, the mega-corporation that connects the two worlds through the only building that could technically be described as a skyscraper both coming and going. By the way, if this all strikes you as being too preposterous for words, you might as well check out now because it only gets nuttier from here on. After the requisite prologue explaining the premise, we meet two two attractive youngsters from the opposing planets — lower world Adam (Jim Sturgess) and upper world Eden (Kirsten Dunst) — as they spot each other from their respective mountain peaks and fall instantly in love. Alas, their idyllic zero-gravity makeout sessions are interrupted one day by guards from the upper world and while trying to get Eden back to her planet, there is an accident and it appears as though she has been killed. Ten years pass and Adam is now working in a dingy Transworld factory while attempting to devise a revolutionary beauty cream that harvests the rejuvenating power of pollen taken from pink bees (and you thought I was just kidding about things got nuttier?) when he is stunned to see Eden on television alive, well and also in the employ of Transworld. Adam then launches an elaborate plan to reconnect with his beloved that, if I have it correctly, entails using his beauty cream formula as a way of getting a job in Transworld headquarters and making requests for samples of the anti-gravity mineral that he will surreptitiously hide on his person in order to sneak up to the upper world and sweep Eden off her feet. It seems impossible that a scheme as well-planned as this could possibly fail but it turns out that there are a couple of minor hiccups. For one thing, it seems that Eden's accident has left her with amnesia, so when Adam finally does get to see her, she has absolutely no recollection of who he is. For another, the anti-gravity mineral has a disconcerting tendency to burst into flame after about an hour of usage. Nevertheless, Adam continues to visit Eden in hopes of jogging her memory. But he finds himself in increasing danger once the Transworld executives finally realize what he is doing. 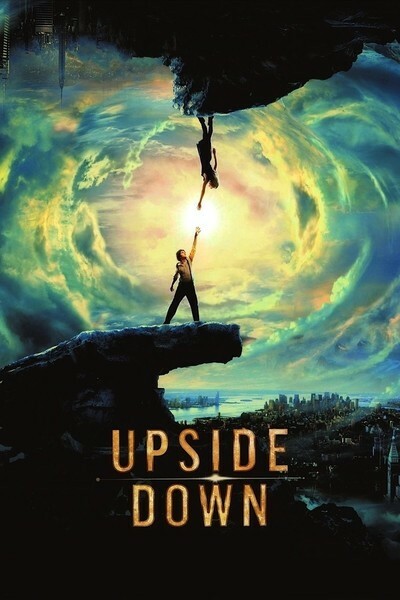 By all rational standards, "Upside Down" is one of the dumbest movies that you will see in your entire life. Right from the start, it takes its first giant misstep with a prologue that is meant to simultaneously set up the story and explain the physics of the twin world gimmick in ways that will more or less satisfy the average moviegoer or at the very least keep them from asking pesky questions about the apparent lack of orbits or how the twinned worlds can have sunrises, sunsets and the like. Unfortunately, writer-director Juan Diego Solanas has made the bizarre decision to explain these details entirely through Adam's voiceover rather than, you know, showing us how it works. This is a bad enough idea on the surface but it sinks (rises?) even further through the dreadful line readings of Jim Sturgess, who is such a wispy twerp her that his character in "One Day" seems to display a Lee Marvin-like sense of gravitas by comparison. Furthermore, why would you not try to supply them with dialogue that didn't sound as if it had gone through Babelfish at least four different times and a conclusion that didn't make "Cannonball Run II" look like a model of Mamet-like closure by comparison? And if you still felt oddly compelled to press on down this particular path, wouldn't you at least make some kind of token effort to hire actors who could work up some kind of convincing chemistry between them? Kirsten Dunst is appealing enough as Eden but due to her character's affliction, she spends much of her on-screen time smiling sweetly while struggling to understand what is going on around her. Jim Sturgess, on the other hand, is downright appalling throughout and spends most of his on-screen acting like a tool while the audience struggles to resist the temptation to bum-rush the screen punch him in his smug little mug. I don't want to suggest that Sturgess is completely useless — though I really do — but the great character actor Timothy Spall turns up in the key supporting role of a Transworld employee who takes Adam under his wing and though he only shares a few on-screen seconds with Dunst, he comes across as a far more convincing suitor than the ostensible romantic lead. That "Upside Down" is one of the silliest movies ever made — did I mention that? — is a fact that I can in no way deny. And yet, I am often willing to overlook numbskull storytelling if the film in question is bold and stylish enough in other areas to make up for its narrative shortcomings, and this is one of those films. Virtually every moment is crammed to the gills with visual marvels ranging from an endless sea of office drones that one-ups the famous shot in the silent classic "The Crowd" to a grand ballroom with dancers twirling about on both the floor and ceiling to a stunner in which Adam escapes some flames that threaten to overtake him by jumping up into a nearby river. Additionally, while Solanas may not know how to write a story, he knows that the best way to approach it is with a bold and unapologetic attitude that finds him swinging for the fences every time. Granted, his batting average may not be perfect (especially in the first and final innings) but asused to be of the great Cubs slugger Dave Kingman, he may hit or miss but when he's at the plate, he's never boring. Maybe the best way to appreciate the film is to bring your iPod and cue up some music to listen to — maybe that fantastic new David Bowie album — while letting the stunning visuals wash over you. That way, you will still be able to experience the best things it has to offer and — who knows? — depending on your choice of musical accompaniment, it might even make more sense than the sound-synched movie.